Shan Shui in the World presents shanshui (山水, landscape) paintings of selected places in the world generated by a computational process based on geography-related information. This project revisits the ideas implicit in Chinese literati paintings of shan shui: the relationship between urban life and people's yearning for the nature, and between social responsibility and spiritual purity. For an audience living in an urban area, a traditional shanshui painting provides them with spiritual support through the depiction of the natural scene of elsewhere. 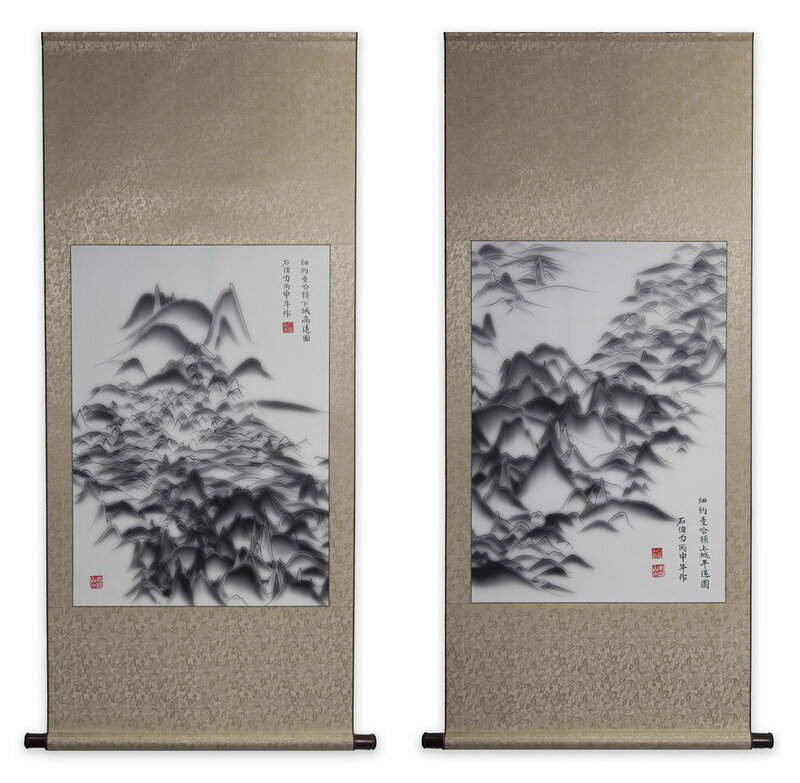 With generative technology, however, Shan Shui in the World has the ability to represent any place in the world—including the city where the audience is—in the form of a shanshui painting based on geography-related information of the place. The notion that shan shui can exist right here (though in a generative parallel world) not only underscores the contrast between the artificial world and nature, but also reminds the audience of an alternative approach to spiritual strength: instead of resorting to the shan shui of elsewhere, we may be able to obtain inner peace from the "shan shui" of our present location by looking inward. 2016. Handscroll. Inkjet print on paper. 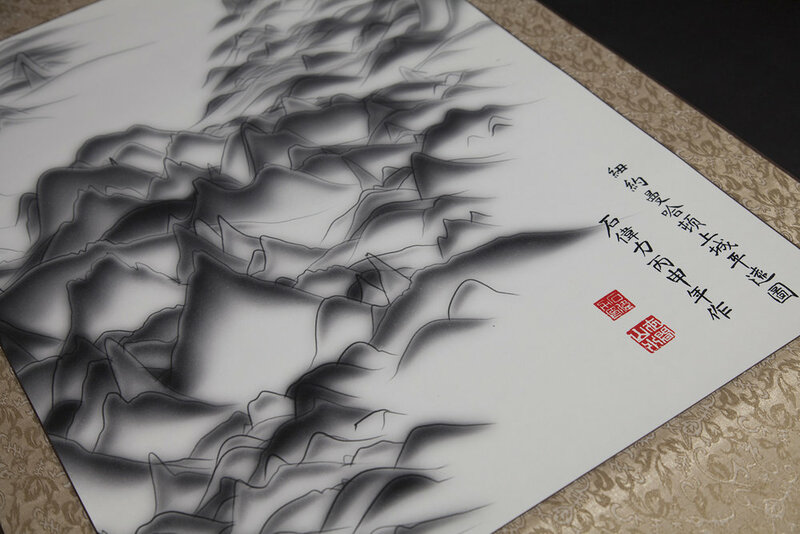 (192 × 12 inch) Details of the handscroll. 2016. Handscroll. Inkjet print on silk. (178 × 12 inch) Partially unfurled handscroll, together with a furled one in a samite box. Downtown Manhattan, New York, High Distance. Uptown Manhattan, New York, Level Distance. Blue-green Downtown Manhattan, New York, High Distance. Blue-green Uptown Manhattan, New York, Level Distance. 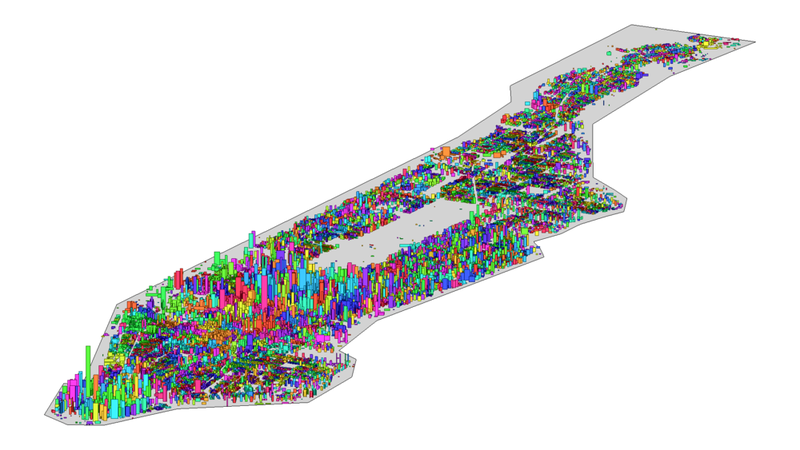 In this first production of Shan Shui in the World, the shan shui of Manhattan, New York is generated based on its building information. The generative engine was written in C++ with use of creative coding toolkit openFrameworks. The code that renders the shanshui painting was written in OpenGL Shading Language as fragment shaders. Height and area of the buildings in Manhattan, New York plotted according to their location. Adjacent buildings merged into mountains, indicated by colors. Outline of the mountains generated based on building information. Mountains rendered in the style of ink-wash painting. Mountains rendered in the style of blue-green shan shui. Details of a scroll painting. Two seals and their imprints, together with red ink and a carving knife. BETWEEN SPACES: Parsons MFA Design + Technology Class of 2016 Thesis Exhibition. May 17—21, 2016. Parsons School of Design, New York. Overfitting. August 26-28, 2016. Ouchi Gallery, New York. NYC Media Lab 16. September 22, 2016. Columbia University, New York. Metamorphoses: VISAP'16, the IEEE VIS Arts Program. October 23-28, 2016. Baltimore Convention Center, Baltimore, MD. Digitalia. March 18-April 15, 2017. Barrett Art Center, Poughkeepsie, NY.